As a highly-accurate tooling method that uses electrical energy to cut, drill, etch and machine metal parts, wire EDM has a long list of applications such as stripper plates, gears, punches, stamping die components, and producing plastic molds. Wire EDM – Wire Cut Company, Inc. In order to electrically discharge machine a metal part using wire, a hole or perforation must already be made in the metal – this is usually done by small hole EDM. 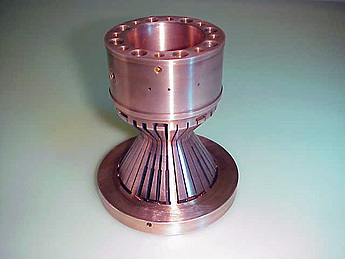 Wire EDM can then be accomplished through sparks produced from the wire which is connected to a source of power or a generator. The sparks are electrical discharges that can generate heat anywhere from eight to twenty thousand degrees depending on the required processing temperatures for the work piece. Unlike plunge EDM, in wire EDM processes, a thin brass wire is fed through the pre-drilled hole in work piece and clamped on both ends by diamond guides. The wire is then used to create an intense electrical field between itself and the work piece with the electrical discharge, or sparks, eroding the surface of the work piece in the desired pattern or shape. There is no actual contact between the electrode and the work piece, but rather a conductive path that is established between the electrode and the material. This process takes place in a bath of dielectric fluid, which prevents premature sparking and flushes away debris, conducts electricity between the electrode and the work piece and then flushes out the melted material. Wire EDM is used for cutting shapes through a selected part or assembly. 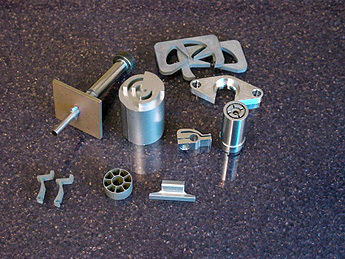 Industries that utilize wire EDM machining technology include electronics, tool and die, aerospace, robotics and medical. Wire EDM offers several advantages compared to conventional cutting methods including the ability to machine complex shapes and patterns and to machine very hard materials, such as stainless steel, titanium, carbide and inconel, at close tolerances. Wire EDM is also a cost-effective and flexible machining process. Disadvantages of wire EDM include heavy electrode wear due to the nature of the electrical discharge process, and a slow rate of material removal making the conventional EDM process time-consuming. However, some technological developments in wire cut EDM include using multiple heads for cutting two materials at once, control for preventing wire breakage, automatic self-threading features and new programmable machining strategies for wire EDM optimization. Wire EDM Also known as electrical wire erosion, wire EDM is one of the most common types of electrical discharge machining, which uses the most accurate types of machining equipment to manufacture hard metals and other materials that are difficult to machine cleanly with conventional mechanical-cutting methods.